^ 1.0 1.1 Cerebrovascular disease – Introduction – NHS Choices. www.nhs.uk. [2015-09-01]. ^ Stroke. 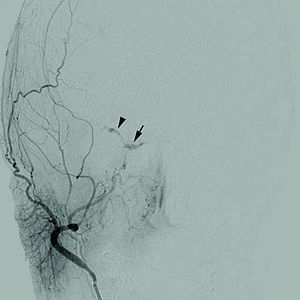 Diagnosis and Therapeutic Management of Cerebrovascular Disease | Revista Española de Cardiología (English Version). www.revespcardiol.org. [2015-09-01]. ^ Stroke: MedlinePlus Medical Encyclopedia. www.nlm.nih.gov. [2015-09-01]. Chan, Pak H. Cerebrovascular Disease: 22nd Princeton Conference. Cambridge University Press. 2002-03-28. ISBN 9781139439657. Mark, Steven D.; Wang, Wen; Fraumeni, Joseph F.; Li, Jun-Yao; Taylor, Philip R.; Wang, Guo-Qing; Guo, Wande; Dawsey, Sanford M.; Li, Bing. Lowered Risks of Hypertension and Cerebrovascular Disease after Vitamin/Mineral Supplementation The Linxian Nutrition Intervention Trial. American Journal of Epidemiology. 1996-04-01, 143 (7): 658–664. ISSN 0002-9262. PMID 8651227. doi:10.1093/oxfordjournals.aje.a008798. Ning, MingMing; Lopez, Mary; Cao, Jing; Buonanno, Ferdinando S.; Lo, Eng H. Application of proteomics to cerebrovascular disease. Electrophoresis. 2012-12-01, 33 (24): 3582–3597. ISSN 0173-0835. PMC 3712851. PMID 23161401. doi:10.1002/elps.201200481.